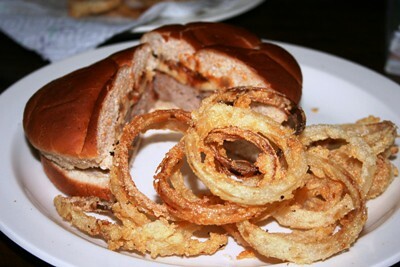 homemade onion rings, originally uploaded by All Things Mimi. This was my first attempt at home made onion rings. I got the idea watching Barefoot Contessa Back to Basics on Foodtv. Basically, I just cut a yellow onion into thin slices, soaked them in buttermilk and hot sauce for about 15 minutes, then dredged them in a mixture of flour, corn meal, salt and pepper. They fried for about 1 minute per batch. I was very satisfied with the result, and they were delicious on my turkey burger. But my gosh, what a mess they make in the kitchen. I think I will have to experiment with a baking method. Maybe then I can justify having them more often!